A charismatic, public school educated Prime Minister from County Durham takes the country to war in the Middle East. With a valued western ally, and Israel, in tow, a pre-emptive strike is launched on the basis of a false prospectus. The whole adventure falls apart when the truth becomes apparent. After a short interval, the Prime Minister resigns, and his Chancellor steps up to take his place. This is not a reference to Tony Blair, but to the calamity which Sir Anthony Eden brought upon himself at Suez. Substitute America for France, and there is certainly a sense of deja vu about the Iraq debacle. There were, of course, voices in government - particularly amongst the Foreign Office Arabists - who could see the dangers facing both the Blair and Eden governments as they rushed into the military and political mire that is the Middle East. But headstrong leaders are able to force their way through the advice offered them, and through the constitutional checks and balances which offer restraint against the temptations of impetuosity. Sometimes, when obduracy meets reality, moderation is the outcome. On other occasions, self-delusion is the order of the day. It is a short step from deluding oneself to trying to delude others. 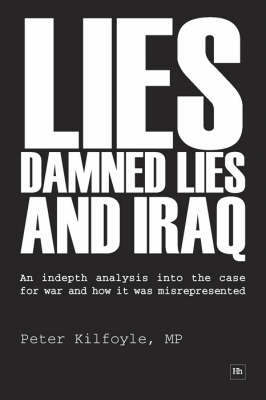 This book is an attempt to find a way through that delusion, through the smoke and mirrors of spin and propaganda. The objective is to show - using the words of the principal participants - just how the case for war was misrepresented. Let those who embarked on this illegal and immoral war be condemned from their own mouths.